Aiseesoft HD Converter for Mac is an easy to operate Mac HD Video Converter, which enhances your experiences on enjoying HD videos on players, since this HD Converter for Mac can convert HD video, like AVCHD (MTS, M2TS), HD TS, HD MPEG, HD WMV, HD MPG, HD MP4,QuickTime HD MOV, HD H.264, HD RM video, etc with super fast conversion speed and excellent sound/image quality. It can also convert SD video to HD video, or SD video to SD video conversion. ...... to HD video, or SD video to SD video conversion. Audio Converter or Audio Extractor are added in this Mac HD Converter. Furthermore, the editing tools provides you the ability to optimize your output video/audio quality, like convert part of your HD video, crop, merge, and set video/audio settings, capture picture or something else. 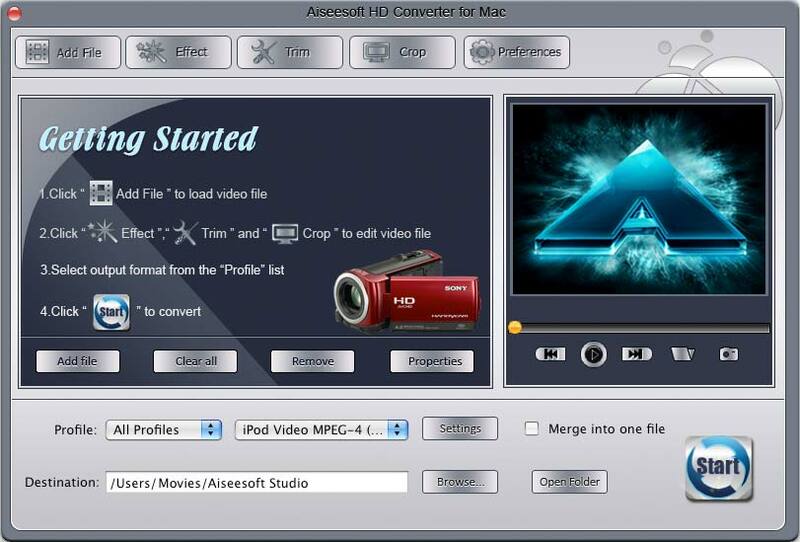 Aiseesoft HD Converter for Mac is fully compatible with Mac OS, which can run on Intel and Power PC processors. Fully accept most HD videos as input and output video formats, that's to say, you are easy to convert HD video to HD video, HD video to SD video, or SD video to HD video, including AVCHD (MTS, M2TS), HD TS, HD MPEG, HD WMV, HD MPG, HD MP4, QuickTime HD MOV, HD H.264, HD RM video, etc. Qweas is providing links to Aiseesoft HD Converter for Mac 3.2.20 as a courtesy, and makes no representations regarding Aiseesoft HD Converter for Mac or any other applications or any information related thereto. Any questions, complaints or claims regarding this application Aiseesoft HD Converter for Mac 3.2.20 must be directed to the appropriate software vendor. You may click the publisher link of Aiseesoft HD Converter for Mac on the top of this page to get more details about the vendor.